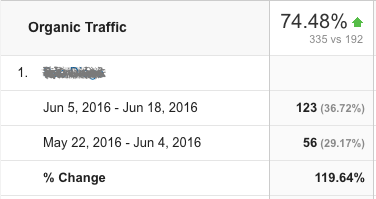 Result: Immediate 120% increase in local traffic. Eight attorney firm in mid sized city practicing a wide array of law. The client had a prior personal experience very similar to a sensationalized current news story. Through some basic outreach, he was able to share his story with journalists already writing about the issue. Efforts involved very traditional PR-style outreach (without the typical Press Release) to news outlets covering the primary story. The end result was a large number of unstructured citations referencing the client and his firm on highly authoritative sites (none of which were in his specific geographic market). The accompanying table here shows the week over week increase in search based traffic in their specific geographic market immediately after the citations.